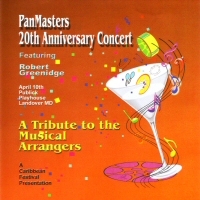 In 2005 Pan Masters Steel Orchestra celebrated 20 years of bringing steelband music to the Washington, DC area. Their 20th Anniversary Concert took place on April 10, 2005 at the Publick Playhouse in Landover, MD. World-renowned steelpan performer, composer, arranger and recording artist Robert Greenidge was their featured guest. The concert was recorded with a full complement of over 30 players. Pan Masters performs selections of calypso, jazz, classical, pop, R&B with musical arrangements by Kristen Jones, Roger Greenidge and Lennard Jack.